Andrew Gillum, the mayor of Tallahassee, won the Democratic nomination in Florida’s gubernatorial primary on Tuesday night, thus putting him one step closer to possibly becoming the state’s first black governor. Gillum, 39, will face Republican Rep. Ron DeSantis — who has support from President Donald Trump — in November’s midterm elections. The progressive Gillum boasted backing from Sen. Bernie Sanders, and pulled a surprising upset in narrowly defeating the front-runner: former Democratic congresswoman Gwen Graham, the daughter of a well-liked former Florida governor and senator. Gillum is now the second young African-American Democratic candidate who could become his state’s first black governor, following Georgia’s Stacey Abrams. 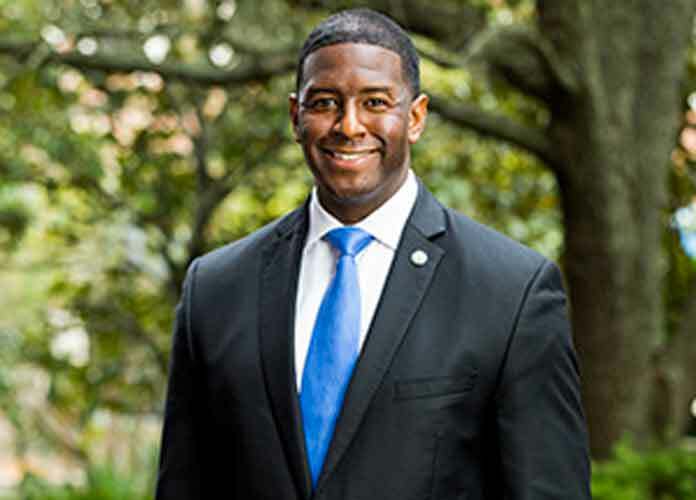 “We’re going to make clear to the rest of the world that the dark days that we’ve been under, coming out of Washington, that the derision and the division that has been coming out of our White House, that right here in the state of Florida we are going to remind this nation of what is truly the American way,” Gillum said in his victory speech Tuesday evening. Another big winner on Tuesday was Democratic Rep. Kyrsten Sinema, who won Arizona’s Senate primary. Sinema, 42, will face GOP Rep. Martha McSally in the fall. According to the New York Times, McSally asked Trump to stay out of this race, which is being held to replace retiring Republican Sen. Jeff Flake. However, McSally also reportedly tried to get the president’s support a few weeks ago. McSally, a former Air Force member, easily defeated a pair of far-right conservatives to win Arizona’s GOP nomination for senator: former anti-immigrant sheriff Joe Arpaio — whom Trump pardoned in 2017 — and former state senator Kelli Ward. Arizona has never elected a woman to the Senate, so either Sinema or McSally will make history. In Arizona’s gubernatorial primaries, Democratic candidate David Garcia won his party’s nomination to face off against incumbent Republican Gov. Doug Ducey. Garcia previously worked in Arizona’s Department of Education.